What does Let Us Shine do? Let Us Shine is a Glasgow charity primarily focused on developing and delivering sustainable education projects for children in Ghana. We work closely with local communities, local businesses, international organisations and agencies to design, develop and maintain our projects which ultimately support the rights of children and families in Ghana. We ensure that all the work that we do is sustainable through developing close ties with local communities and businesses which will helps reduce, and eventually end, the need for reliance on charitable organisations and donations in the future. 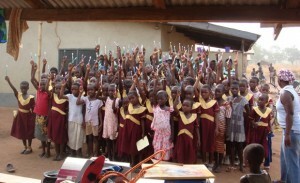 Use the links below to see how we work in Ghana.